Come join us for superb live jazz in one of the best listening rooms in town! The Southside Beer Garden and Bottle Shop provides an excellent atmosphere with the kind of weathered, wooden acoustics found in the best jazz venues in the world. Not to mention their fine, curated beer selection and state-of-the-art draught system; this venue is a pleasure to play at and to relax and listen. 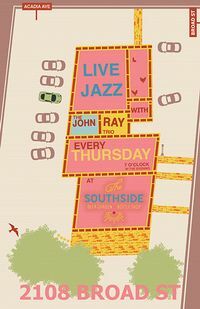 John Ray is a jazz/progressive bassist from Winston-Salem, NC, and the band features the best jazz players from the area.